But these ended up being far uglier than the read deal. There are not too many differences, but the differences there are make the BIGGEST difference. First of all, the main hat will be black, all black. No multicolored hats. And the orange alternate jersey in that rendering is actually bright orangy-scarlet, and looks really nice. 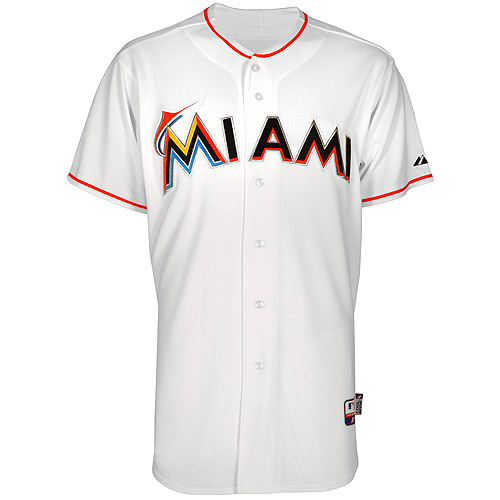 This will be their alternate jersey, the only one of the four jerseys to display “Marlins” across the chest. All the other jerseys: the home, away, and black alternate, will display “Miami” on the chest. Jeffery Loria explained this as being a tribute to the great and unique city of the team. Most major league teams display their mascot name on the home uniforms, and their city on the away. The new home jerseys are white with “Miami” on the front. With the home and alternate jerseys, white pants with a black pinstripe on the side will be worn. 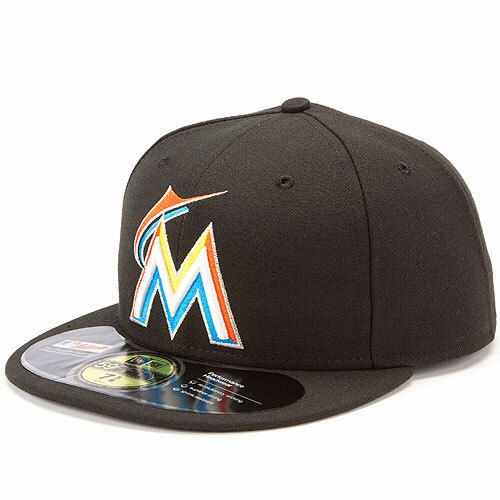 New Miami Marlins merchandise is now available in the online shop. One of the hats is the orange color of the jersey shown above, but I do not believe that hat will actually be worn on the field. During the unveiling fashion show, only black hats were worn. The official logo is the one that was leaked back in September, and the one on the jersey to the right. 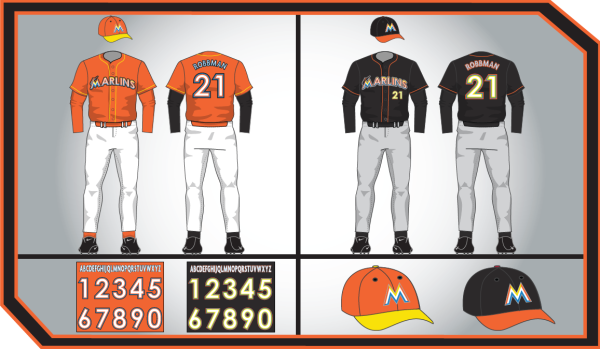 The away uniforms for the Marlins are simply gray versions of the home jerseys and pants. Personally, I am excited about the new uniforms. I originally thought that this “new and original” look was actually just modern and ugly. But its originality, I realized, is actually for the better. Now that I have seen it on the players, I don’t think it’s that bad. Marlins.com switched over to the Miami theme very quickly, and now I’m just waiting to see if my MLBlogs theme will change too (scratch that). I still don’t know what to think if these things. Sometimes gaudy is good, and it works. I really miss the old Houston unis, and the orange here reminds me a little of that. I’ll have to see what the Mermaids are wearing, though, before making up my mind! Well I haven’t been to a Marlins home game, so I never even thought about the Mermaids, but I assume they’ll wear team colors, so orange and black. I was just afraid that they would incorporate too much yellow, but they didn’t. Well look at that, your blog theme is now switched. Those MLB.com people work fast when marketing is involved. As for the jerseys, I too was fearing the worst. I like the orange, but not a huge fan of the black. Just too many teams using it these days. Overall, I like the new unis. Now I’ll wait (impatiently) for my Jays to reveal their new duds on Friday. Yeah, I need to go in and edit that. I really like the new theme. I’m very relieved with the new looks, and share your opinion on the black jerseys. They’ll probably be more comfortable in those now that the stadium will be climate controlled. I love everything new; the new name, the new stadiums, the new logo, except for the jerseys. The alternative dark jersey is kinda dull, and the orange one is a bit too flashy. The hats do look pretty good though. I agree with you, but I think the orange jerseys are just good enough. 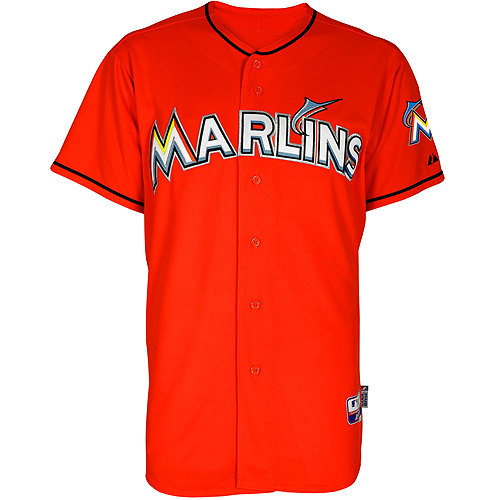 A lot of teams have colorful jerseys they wear on Sundays at home, like the Nats in red, the Giants in orange, and the Royals in light blue, so it’s not like the Marlins will be wearing it too much. I’m not a big fan of the font on the jerseys, but hey, we’ll get over it.